Unfortunately the Eclipse mill has had to be brought down, for safety reasons. My father is the current managing director of Jones Textilities, the owners of the mill. I am researching into my family history and that of Jones Textilities. 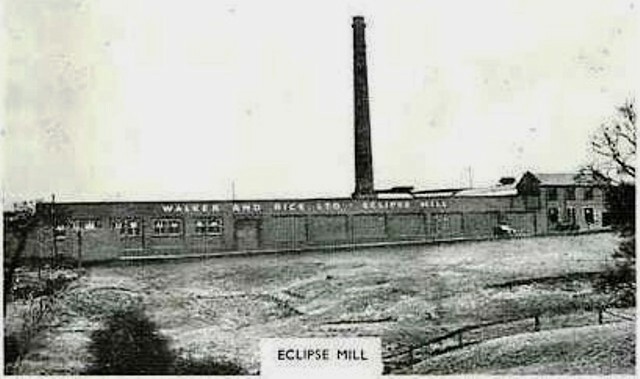 Simon - I do have further photos of Eclipse as it was our old family mill. Let me know if of interest. Simon - I do have some further photos of Eclipse as it was our old family mill. As a follow up, I hope I'm wrong about the demolition, as having looked on Bingmaps, there was a substantial section of reduced chimney left (maybe 20 foot) which would have made it fairly significant in Blackburn...i'll have a look tonight. Sorry Lorcan, I can't help you with the location of Eclipse Mill, as I've no idea where it was situated. The photo is from an old advert and all it says is Feniscowles. It doesn't give a street or road. I've had a look through my directories and the Industrial Heritage book, but again in those, it just says it was at Feniscowles, nothing more. I'm sure someone will let us know in time. Just typed it into a search and it came up with a road name (Eclipse Road). Had a look on the streetmap site and it is where you said. Opposite the filling station you have the bottom end of Park Farm Rd. Turn left off that first bit of Park Farm Rd and you get to Eclipse Rd and the mill is/was just at the far end, close to the canal. ...well, it's gone. Digger is still on site - bricks have been paletted up for use elsewhere (much like those of Albion Mill). Bricks stated "Withnell Brick and Terra Cotta Company 1912 Ltd"..name wise, it seemed to be part of the Feniscowles astronomy trio (as named by me!) - Sun, Star and Eclipse Mills...another loss without most people even knowing! The perimeter wall is just about still there - it looks great in the picture with the chimney too! In that Industrial Heritage book, it states that it was built in 1913, so the bricks tie in nicely there. eclipse mill was used until its closure by jones textilities for the production of wooden products such as ladders fencing panels etc.they were based for many years on audley range making consumables for the textile industry,my grandmother worked there for 50 years until retiring in the 1950s on a pension of 12/6 per month, something not regularly done by private firms at that time. Thanks for the info. Not many people spend 50 years with the one company anymore. Jones Textilaties took over the site in March 1975 which had been used as a carpet factory for many years. I have just visited the site and was shocked to see only the. gates remaining locked as though guarding something precious Further to previous comments yes the factory was situated in Eclipse Road. - what's left of it.